Turbine sensors with electrical transmission output for remote indication of liquid flow rate. 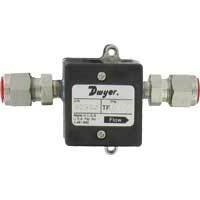 Dwyer turbine flow transmitters are suitable for a wide variety of industrial, commercial, and laboratory flow applications. A power adapter or mating cable assembly is required for operation. 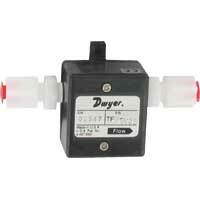 Liquid Turbine Flow Meter is suitable for a wide variety of industrial, commercial, and laboratory flow applications. A power adapter or mating cable is required for operation. Liquid Turbine Flow Meter is suitable for a variety of industrial, commercial, and laboratory flow applications. Utilize a turbine wheel and electro-optical detection to convert flow rates into an output signal. 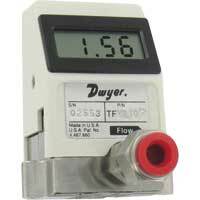 Liquid Turbine Flow Meter is suitable for a variety of industrial, commercial, and laboratory flow applications. LCD informs the user of the actual flow rate. 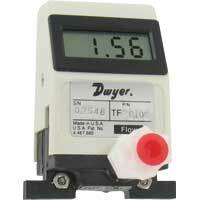 Liquid Turbine Flow Meter utilizes a turbine wheel to convert flow rates into a linear 0 to 5 VDC. Applications include commercial systems, laboratory equipment, and industrial flow monitoring. Gas Turbine Flow Meter utilizes a turbine wheel. 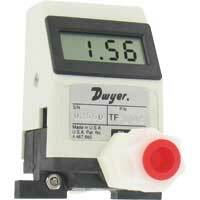 LCD informs the user of the actual flow rate. A power adapter or mating cable assembly is required for operation. Gas Turbine Flow Meter utilizes a turbine wheel and electro-optical detection to convert flow rates into a linear 0 to 5 VDC output signal. I use the TFM-LP Series Flow Meters for some of my OEM project. I am using the Stainless Steel Model at this point because the unit is measuring deionized water, 18 meg ohm deionized water in a clean room environment. Can I use the TFP-LP model with Deionized water? The only difference seems to be the material and pressure rating. The DI loop used is at 60 psi so I'm good with the pressure rating. Is the PPS material good for DI water? 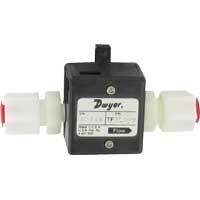 The Dwyer Series TFM-LP Liquid Turbine Flow Meter is compatible with DI water. The PPS material, also known as Ryton, is also compatible with DI water.